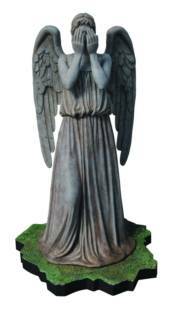 From BIG Chief Studios Ltd. As old as the universe itself, the Weeping Angels are the deadliest, most powerful, most malevolent life-form evolution has ever produced. Able to close distances of meters literally in the blink of an eye, they feed off the potential energy of the years their victims would have lived in the present, killing them in the past. BIG Chief Studios announces the first in a new series of 1:6-Scale Figurines. Featuring three sets of interchangeable arms and two alternate heads to adopt multiple poses, the figurine is cast from heavy poly stone and comes complete with a mini diorama base. Produced in a numbered limited edition, each figurine comes with a Certificate of Authenticity and is packed in a full-color printed box.